File management is a long-term topic, on PC stage and extends to mobile devices stage. Different from PCs, people have to consider what could do to save more space and manage files in neat. 1. Do people need to manage system files of Android OS? 2. Should people always find file in a long list or mussy folders? 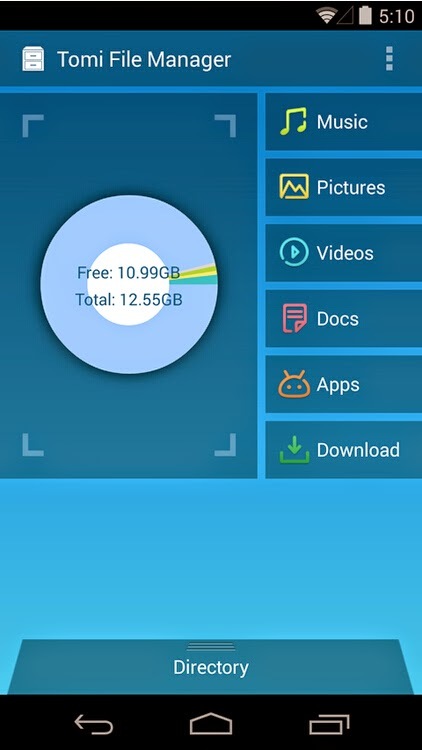 So now we have Tomi File Manager, a simple and fast management solution to YOUR OWN files on mobile devices, by sorting music, pictures, videos, downloads, and installed applications into six intuitive categories, and making you feel no worry to where the physical file located. So, what are the differences between Tomi File Manager and other same kind file manager applications? We sort users’ own Music, Pictures, Videos, Documents, Applications and Downloads into 6 major intuitive categories, and create this easy simple and high efficient way to file management. We design an intuitive user interface to help users know which kind of files they can reach in each category, and let users know occupation rates of each kind of files to mobile storage. Meanwhile, fast indexing is another key point we focus on. Saving time to file indexing is another good way to help users to reach the file they need. Users of Tomi File Manager can easily manage their own files, without disturbance from mussy folders on storage. The system files of Android OS can do nothing but enable users enjoy convenience brought by their smart phone/tablets. So we change the way of managing files, and enable users to manage their own files with intuitive methods. For example, Download folder on mobile device can give us a distinct show. Normally, downloaded files will be saved to the “Download” folder on storage, and users can get what they downloaded via a so-called download manager by mobile phone vendors, or an option called “Download” provided by file manager applications. But two things we should keep in mind: not every application follows this principle, and users also have their own idea to set download folder. Tomi File Manager supports the default download folder, but we DO NOT think that is enough, since our aim is providing people an easy and simple way to manage their own files. So, we decide to enable users to manually add their own download folder for indexing, and make sure all files come to mobile device through the behavior of download must be easy-to-reach. The Download portal on Tomi File Manager now is not a simple link to your download directory, but represents kind of behavior of downloading file to mobile device. Another example is managing pictures on mobile device. Sure people can browse pictures on mobile through build in gallery. But, not every gallery is user-friendly designed; and build-in gallery from different device vendors has its own weakness in managing pictures. Otherwise, currently file manager applications also have different shortcomings in efficiency. Tomi File Manager offers an intuitive mark as “Pictures” in user interface, to give users a clear idea that all my own pictures are here. Otherwise, we index all picture files on storage and show them in timeline by shot date. We may have our own shortcoming to make Tomi File Manager perfect enough, and make it more useful to all users. So we start a weekly poll to features which users suggested. We select some features in collections of feature suggestions from all users every week, and start a poll to top features we should support, both on forum and online community. We invite users to join our weekly development plan, and let users know what we will have in next release. The most valuable thing is bringing users and us joint together to build their own file manager application.